Healthy Music for a Child’s Heart, Body and Mind! We love music and movement! It was how my daughter learned how to ‘jump like a frog’ and throw different colored bean bags at a young age. She also learned to memorize songs, cooperate with dance moves and march in place. As my younger daughter is still a baby, I am still looking for great CDs that she can grow into and also CDs my preschooler still loves. We found that in this fun music and movement CD called Action! Fun! Dance! 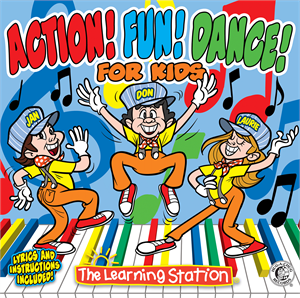 The Learning Station is full of veteran children’s entertainers and it shows when you listen to the CD. Some of the songs were very familiar to me and some were new, but they were all body shaking. One of Brooke’s and my favorite activities is just dancing and it is even better if we have some fun dance moves to follow. Already a winner of tons of 2013 awards, Action! Fun! Dance! comes with an instruction and lyric books which made the experience even better. This brought out the kid in me (which is not too hard to do) and Brooke enjoys our dancing sessions. What a great gift! Check it out! Here is the video for The More We Get Together! This would make a great stocking stuffer! May have to add this to my list.